Now I’m much more familiar with messing about with software, not all this messy hardware stuff, so I’m really hoping to get some feedback to improve this early prototype! So, my theory is that the stuff on the left will trigger the timer on the positive edge of the pulse from the gas meter. R1 and C1 control the 555 timing; more on that in a second. And the stuff on the right (LED and the CurrentCost dev board) should be triggered whenever the gas meter is running and emitting pulses. It all seems to work, except that I can’t seem to get the timing quite right. The gas meter takes about 1m40s between pulses, and I can choose values for R1 and C1 that trigger the output for the right length of time when a single pulse is detected, unfortunately subsequent pulses don’t keep the output on as I was hoping. The best I’ve managed is with R1 = 3M ohms and C1 = 100uF, which does stay on as long as there are pulses from the meter… unfortunately just for a little too long at 5 minutes. Still, at least the CurrentCost Envi will get a reading all the time the boiler is running, and it won’t get stuck on if the meter stops on the portion of the dial where the reed switch is closed. Any comments with glaring errors, small problems, improvements, or a completely different way to do it?! This entry was posted in Ones and Zeros, Uncategorized and tagged 555 timer, circuit diagram, CurrentCost, energy, gas, gas meter, home, home automation, home camp, homecamp, house by jt. Bookmark the permalink. Well done with the post, and the project, its been a long time since I worked with 555’s and I was normally following a diagram. Several peeps at homecamp had done some bits on the Gas front, but I think you are the first to try using the CC Dev board. I will continue to watch your progress, sorry I cannot be more useful. Seemed cheaper and neater (look no wires) to make use of my existing CurrentCost meter, made possible by the homecamp dev boards of course, which is a big bonus. As soon as we’ve finished of the rest of the ice-cream in the freezer, I’ll be making use of the tub to put the prototype outside by the gas meter cupboard to see if it really works, instead of just pretending to be the gas meter and pressing a button myself! It was a shame to miss people dicussing gas meters at the last homecamp but Richard’s arduino gas meter monitor is the best non-CurrentCost alternative I’ve found so far. Hi James. I have a setup using Arduino to condition the gas meter’s pulses. I found they were bouncy but could program around that. Now I want to use the CC128 and debounce in hardware. Looking at your circuit and that of @jcrouchley I reckon they might not work with my meter. I need something to lose all the extra edges I get as the reed switch opens. Look forward to seeing what you come up with. 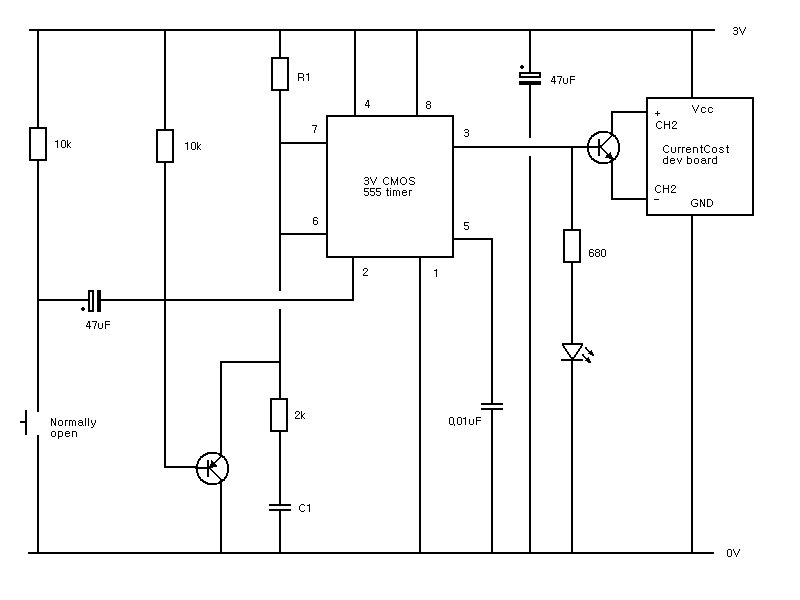 Think I need to go back to the drawing board for my circuit- it seems to be staying on way way too long at the moment. Hi… I’ve been pretty impressed by your work on Gas monitoring and have hacked together something similar for my Gas meter, if you’re interested, it’s here: http://www.virtualnet.demon.co.uk. That’s a great site, thanks for the link. I’d be very interested to hear how you get on with the analogue dev board. Are you following plans for homecamp 3 and xmas do?